Captain John Gray's origins are unknown at present. He entered the navy as a Volunteer in 1696, was promoted Lieutenant in 1702 and, in 1711, was appointed Captain of HMS Folkestone, 40 guns. In 1714 he retired on half-pay but in 1727 went to sea again as Captain of HMS Lark, 40 guns. It can be speculated that his first period of service, brought to an end by the Treaty of Utrecht in 1713, had produced a respectable fortune in prize money. This he invested in land and property in Twickenham. His later tour followed the resumption of war with Spain in 1726 and may have been to seek further prize money in order to replenish his funds. He is first recorded in Twickenham, acquiring land, in 1718. 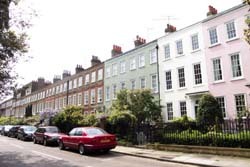 By 1721 he had commenced the construction of 24 houses in Montpelier Row and 10 in Sion Row. Where he lived during this time is not known, though By 1723 he was paying rates for a house and Park, which may suggest enclosed land surrounding South End House. By his will, made in 1725, he named his second wife, Elizabeth, (nee Tufton) principal benefactor during her life. On her death his estate was to be administered by trustees for the benefit of his children of both marriages. There was np provision for his first wife, who may be deemed to have died. The christenings of five children from his second marriage are recorded in the registers of St Mary's: Diana 1721, Charles 1723, Tufton 1724, Elizabeth 1725 and Christian 1726. Tufton took holy orders and subsequently appears to have inherited the Twickenham properties. Elizabeth died in 1757 and, like her husband, was buried in Twickenham. In 1738, according to the Churchwardens Accounts, she was living in Montpelier Row probably next door to South End House. By an addition to his will, Gray had made provision for her to live in one of these houses for the remainder of her life. At his death there were mortgages on some of the properties, including a row of six cottages in Swan Alley (probably beside or behind the White Swan Inn) and these were redeemed by the sale of a number of the houses. The settlement left Tufton with nine houses in Montpelier Row, six in Syon Row and a half acre of land. By this time he was living in Isleworth, but he was still short of money and continued to take out mortgages on his remaining properties. In 1767 he started to dispose of these, some to their occupiers. The sales appear to have been completed in 1769, by which time he had moved to the parish of St James, Westminster. He died some time before 1780. John Gray was known to Pope's friend Lord Bathurst who asked to be remembered to him in a letter to Pope dated 19 September 1730. In his answer dated 1 October Pope mentioned, somewhat ruefully, that he was looking after Captain Gray's boat: "Capt Gray's boat is in my Custody, ready equipped with Sails, flags, Pennons, &c. What shall be done with it? Tho' I can keep it in my Boathouse all the Winter if you please." 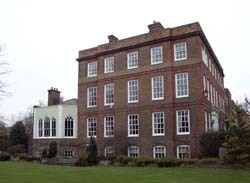 Pope's dealings with Mrs Howard (later Countess of Suffolk) at Marble Hill included advice with the layout of her gardens and this could have brought him into contact with her neighbour, Gray. In May 1729 Pope intervened, perhaps unwisely, in a dispute between and Mrs Vernon of Twickenham Park and Henrietta Howard at Marble Hill concerning the status of a piece of land adjacent to Montpelier Row. Pope wrote to Henrietta assuring her that “they expect Captain Gray every day here. As soon as he comes I will see him.” With the Treaty of Seville concluded, Gray's ship was probably being paid off so marking the end of his service career and his return to property life in Twickenham. "Capt Gray's boat is in my Custody, ready equipped with Sails, flags, Pennons, &c. What shall be done with it? Tho' I can keep it in my Boathouse all the Winter if you please."